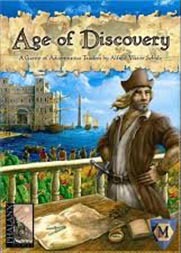 Buy PRIMO's exclusive board game "Age of Discovery" today! Yours for only $59.90! Free shipping and handling. A board game inspired by the explorations of Christopher Columbus! Fun and educational is "Age of Discovery." The board game puts you in the role of an Italian or European explorer of the early 16th century. Just like Christopher Columbus, you and other players vie for the support of kings and queens to discover the lands of the New World. You compete against each other to gain merchant vessels, ship crews, and the fulfillment of trade contracts to make the money in order to fund the journey. Modeled after the exploits of Christopher Columbus, "Age of Discovery" will allow you and your family a fun way to better understand the achievements of the great Italian explorer and those like him, such as Giovanni Caboto, Amerigo Vespucci, and Giovanni da Verrazzano. "Age of Discovery" comes with 50 ship cards, 12 expedition cards, 24 trade contracts, 12 special mission cards, 12 action cards, 88 wooden tokens, 1 victory point chart, 60 coins and 1 rules booklet. A great game for the whole family. Now on sale through PRIMO...Just $59.90 and as always...free shipping! Buy PRIMO's exclusive game "Marco Polo Eastern Expeditions" today! Yours for only $39.90! Free shipping and handling. Quest: Can you help Marco Polo complete his expedition? Can you move the metal ball safely through the labyrinth? 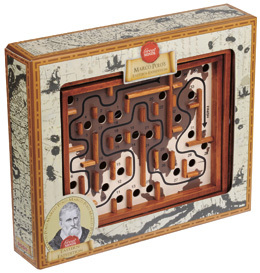 A simple and fun game to inspire your child or grandchild to learn more about Marco Polo and other Italian explorers. A Venetian merchant who embarked upon an epic adventure with his father and uncle all around Asia, including China, India and Japan. These were lands unknown to Europe at the time. They travelled continuously for 24 years some 15,000 miles. They stayed with kings and emperors including Kublai Khan. On their return to Venice in 1295 Marco Polo was imprisoned after the invasion of Venice by Genoese. There he wrote "The Travels of Marco Polo" which became famous throughout Europe as the first real account of the exotic east. His travels were an inspiration to other explorers, even Christopher Columbus. Now on sale through PRIMO...Just $39.90 and as always...free shipping! 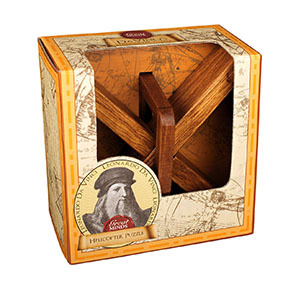 Buy PRIMO's exclusive "Leonardo da Vinci Helicopter Puzzle" today! Yours for only $19.95! Free shipping and handling. Aim: Can you take the Helicopter apart? When solved, the puzzle will be in three separate pieces. A simple and fun puzzle to inspire your child or grandchild to learn more about Leonardo da Vinci. Leonardo da Vinci (1452-1519) Engineer, inventor, scientist, architect and artist. Known as the Universal Man, he is widely considered to be the most diversely talented person to have ever lived. Among his many achievements, he painted the world famous Mona Lisa. He was a universal scientist who made important discoveries in civil engineering, optics, hydrodynamics and anatomy (mapping the internal structure of the human body). Leonardo's failure to publish his findings limited their influence on the future course of science. One of his designs, for a helicopter, looked remarkably similar to the first such machine, which was built 400 years later. Now on sale through PRIMO...Just $19.95 and as always...free shipping! 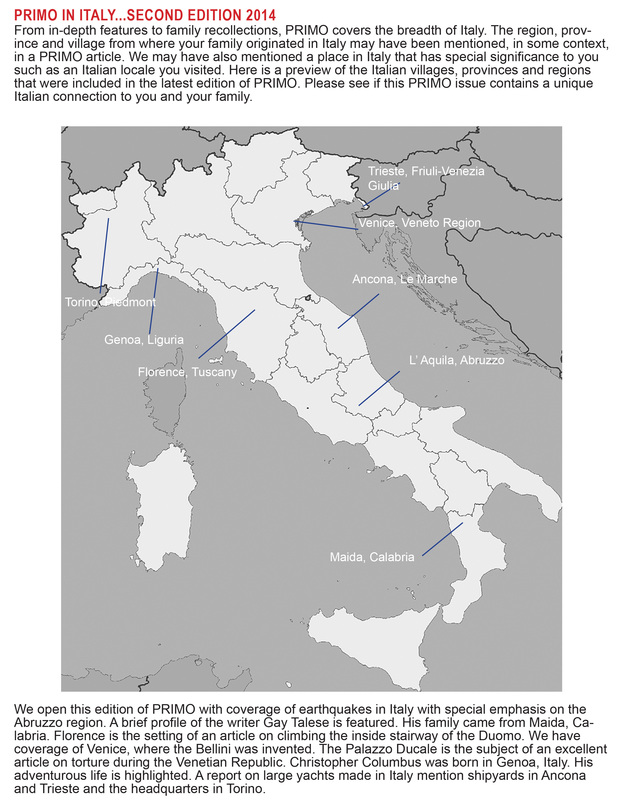 Buy PRIMO's exclusive "Galileo Globe Puzzle" today! Yours for only $19.95! Free shipping and handling. Will you be able to master this challenging set of wooden brainteasers? Aim: Separate the pieces, then see if you can rebuild the comet and the globe. Galileo Galilei: Italian scientist and astronomer. 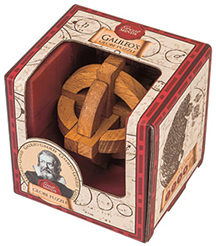 As well as the telescope, Galileo also developed the compass and the thermometer. He claimed that the Earth was not the centre of the Universe but that the planets, including Earth, orbited around the Sun, a controversial theory at the time! By watching a lamp swinging in a cathedral he made discoveries about the perpetual motion of a pendulum. He worked out that a cannonball fired from a cannon follows a special kind of curve called a parabula. His fabled experiment at the top of the Leaning Tower of Pisa demonstrated that objects of different weights will fall at the same speed.